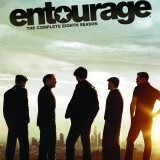 Hollywood Sunset: A Farewell to Entourage - This extra is a thirty minute retrospective that includes series creator Doug Ellin, writer/executive producer Ally Musika, and actors Adrian Grenier, Kevin Connolly, Kevin Dillon and Jerry Ferrara. They talk about the rough start the show had and how it evolved. Jeremy Piven and Rex Lee also join in and offer their perspectives on the show and their characters. We also get to see some of the cast’s auditions and behind the scenes footage. All of this is entertaining but I wish it had been longer especially since this is the only extra on this set.